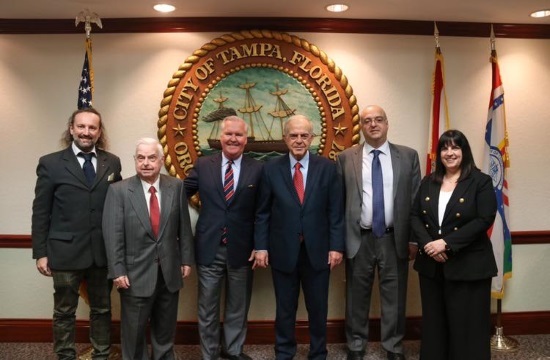 TAMPA, FL – The official signing ceremony of the Sister Cities Agreement between Mayor of Tampa Bob Buckhorn and Mayor of Heraklion, Crete, Vasilis Labrinos, was held on January 31 in the Sister Cities Room of the Tampa City Hall. The event was free and open to the public. Important figures of the Greek community attended the formal signing, including the Consul General of Greece in Tampa and Advisor to the Committee Dimitrios Sparos, the Chairman of the AHEPA Family Tampa and founding member of the Sister Cities Committee Gus Paras, Tarpon Springs Mayor Chris Alafouzos, AHEPA officers and members, Daughters of Penelope officers and members, as well as representatives and members of the University of South Florida Morsani College of Medicine Academic Alliance and Dermatology, University of South Florida-College of Arts and Sciences, the Pancretan Association of America, the Pancyprian Association of Florida, and the Panhellenic Federation of Florida. After the ceremony, Tampa Mayor Bob Buckhorn spoke exclusively with The National Herald. He said, “The official signing ceremony means a lot to us because we have lots of friends and neighbors of Greek descent, there is a huge Greek population at Tarpon Springs. The Chairman of AHEPA Family Tampa Gus Paras and the Consul General of Greece in Tampa were asking me if there is something we could do and I said let’s do it. It was a great opportunity to establish this relationship with the country of Greece and particularly with this city which is so similar to Tampa. This is the last event I’m doing because I’m leaving office in 90 days. The reason we chose Heraklion and not other cities were many, reasons such as similar size, port city, cultural purposes, for educational exchange, we already have relationships with the city and the University of South Florida at the medical school and I’m looking forward to that growing. The foundation was already there, we just had to formalize it today. “Now we are going to see more residents of Tampa traveling to Greece and Crete in particular. Tampa has in the recent years expanded in global perspective. I want Tampa to have a presence on the international stage, we want to build bridges, not walls. Tampa is a very vibrant and energetic city and I think in ten years it is going to be the financial engine of the Southeast. We have the largest port in the state of Florida, we speak multiple languages, we have multiple cultures, and we are proud of that. This is not the typical Southern city, we have a lot of benefits. Everybody knows about Miami and Orlando, but they don’t know a lot about Tampa. It has all the amenities of a big city culturally, the restaurant scene started to grow, people are accessible, the government is close to people. We also have the biggest media market in the State of Florida and the eighth largest in the country,” he said. When the ceremony ended, a formal banquet was held to honor and commemorate the signing of the Tampa-Heraklion Sister Cities Agreement and it was followed by speeches from the mayors and other dignitaries, authentic Greek cuisine and a Cretan dance group performed traditional Cretan dances. The Tampa-Heraklion Sister Cities Committee is currently working on possible cooperation between Tampa Museum Antiquities Department and Heraklion Museum and Knossos Museum, as well as cooperation with the University of South Florida with the College of Liberal Arts, developing cooperative programs with the USF Medical School, an exchange program between USF Morsani College of Medicine and the Medical School in Crete, exploring an exchange program as part of the Education Abroad USF World, a program to bring Greek culture to the public-school systems of the area, establishing a Hellenic Chamber of Commerce for Florida, and establishing a Robotics program for middle schools jointly with American and Cretan schools.